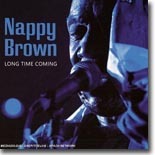 Veteran blues shouter Nappy Brown returns to the international scene with his first CD, Long Time Coming, in many years. It's this month's Pick Hit. Another blues/soul singer not heard from in a while is Betty Harris. Her new CD, Intuition, is so good that it was an easy choice as our Surprise CD of the month. O.V. Wright was unquestionably one of the finest soul singers of all time. The excellent collection The Soul of O.V. Wright is this month's Flashback feature. Our What's New section features new releases from Rod Piazza & the Mighty Flyers Blues Quartet, Dave Riley & Bob Corritore, Jeffrey Halford and the Healers, Coco Montoya, Ronnie Earl, Monster Mike Welch, Ellis Hooks, and more, plus a DVD of Eric Clapton's Crossroads Guitar Festival.